Every year we challenge the world's leading professional PC builders to craft the most technologically advanced, innovative, eye-catching PCs they can. We call this competition Dream PCs, and here is the third entry - the phase change-cooled Cryo PC Graphite. 1. Achieve the maximum reliable performance available, balanced across the CPU, 3D graphics acceleration, memory bandwidth and storage subsystem. 2. Create a practical machine in a case that’s similar in size to a conventional tower PC. 3. Minimise noise and use standardised components that can easily be upgraded when new technology becomes available in the future. 4. Create a plain and simple, but elegant look that’s convenient and practical – a machine that would look at home in the home office or the workplace. 5. Minimise the cost and need for professional technical maintenance or intervention. Here's a teaser video of the Graphite for you to feast your eyes upon. 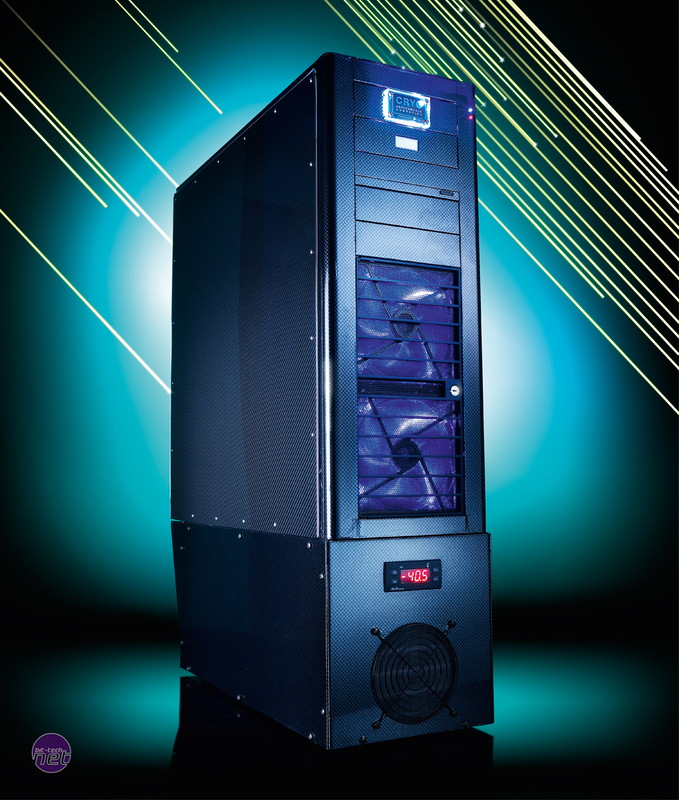 Cryo PC continues 'Using the record-breaking Cryo Velox Phase design as a base, we were able to get a stunning machine with breathtaking performance off the drawing board and into a reproducible design for consumers within two months. As with all Cryo designs, all elements of the machine have been tweaked, tuned, configured and overclocked to deliver overall performance enhancement that provides a system with more performance than the theoretical sum of its parts should. The core CPU clock, memory, bus speeds, GPU clocks – even the VRegs – have been turned up. To cope with this, we have used the best possible cooling solutions all round. Remarkably, even though the system is working harder than any system in its class, it runs cooler and more effortlessly than systems with a tenth of its performance capability. 'The Graphite is designed for the PC enthusiast, computing performance addict, chess guru, scientific or business number cruncher, 3D graphics designer or just about anybody who needs a desktop PC that runs as fast as is physically possible to improve their enjoyment or their productivity. It’s the definitive desktop supercomputer. 'The Graphite isn’t cheap though, and it just isn’t right to consider it a PC purchase in the normal way. It’s an investment in a high-performance computing platform that should last many years. All Cryo PCs are designed with this longer-term investment plan in mind. 'Typically, when you need more performance you would just buy a new machine and throw away your old one. A Cryo PC is designed with some headroom so that you have plenty of upgrade options. You can add disks, a second power supply, graphics and memory, upgrade the CPU and extend the cooling, swap motherboards… the list goes on. 'Cryo PC’s argument is that while a PC designed this way costs a little more initially, you get the best that current technology can offer with a lead over a factory machine’s performance by the equivalent of three years or more. Over the long term, by upgrading instead of replacing your PC, you save money, save the planet and save a lot of inconvenience at the same time. Having said this, the Cryo Graphite is generally for those who prioritise the ultimate in performance and capability over price. 'The Graphite is so named because it has been finished in carbon fibre. Carbon fibre was a natural choice as its appearance and mechanical properties are consistent with the design aims of the machine it encases. It’s an extremely strong, light, elegant, flexible material. What better material to cover the most powerful desktop PC in the world with than the best building material available to modern designers. Wherever the challenges are of an extreme and high-tech nature, you’ll find carbon fibre and the Graphite. Nothing but the best would suffice for the Graphite. Taking a processor to zero Celsius and below improves its performance, stability and longevity. This is achieved with our own-design phase-change system with slightly overcharged high-performance gases capable of under -40°C. It can hold the CPU fully loaded at around -30°C, which adds another 300MHz or so to the top-end performance capability. For the best all-round performance, using extreme cooling on the CPU isn’t enough. The graphics and chipset also need attention. We’ve employed Koolance-designed full-cover waterblocks on the graphics cards, chipset and VRMs. Koolance blocks are copper based and nickel or gold plated to reduce problems and performance drop-off due to surface oxidisation. In addition they look great since they don’t tarnish and lose that perfect finish. 'To ensure the system is as quiet as possible, all fans are managed by an mCubed T-Balancer according to a combination of digital and analogue sensors around the vital parts of the machine. 'The challenge for storage performance is the inevitable dichotomy of high random access speed versus high transfer rates while maintaining reliability. A RAID volume will give the latter two features at the expense of the first. To get round this issue, the Graphite has a half-terabyte RAID 0 volume of Corsair high-performance twin 256GB SSDs, capable of providing well over 400MB/sec transfer rates and under 0.1ms average seek times. 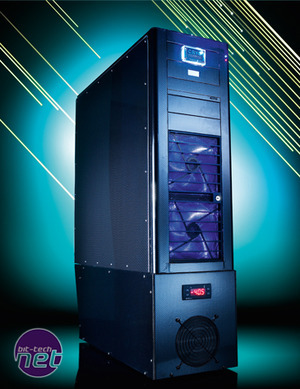 For the best performance and reliability with redundancy, there’s nothing better than a RAID10 volume, and with hot-swap bays, this is the perfect choice for the Graphite. A minimum of four drives are required for RAID10, and our drive of choice is the 1TB Seagate 7200.12 with their highest-in-class 500GB per platter storage density. They deliver the high volume data storage together with similar huge transfer rates able to saturate the SATA bus at over 400MB/sec. You can safely remove any of the RAID10 drives and the system will continue running without even a performance hit (unlike RAID5). 'We look for high-fidelity sound and a very high signal-to-noise ratio to ensure that other electronics in the PC don’t detract from the quality of the sound it reproduces. Second, we want to ensure that the CPU in the machine is freed from having to perform any sound processing tasks, releasing valuable cycles to do other work. The Asus Xonar D2 excels at this and is our chosen card for the Graphite. Despite ATI’s resurgence, the fastest single GPU is still the Nvidia design and architecture. With Zotac’s Dual GPU GTX 295 Infinity card, we’ve been able to create the dream Quad SLI configuration with all four overclocked GPUs working concurrently. We custom overclock our cards in the card’s own BIOS so it’s possible to change host machine or software configurations without affecting the cards’ high performance. Standard coolers are always removed from cards, cleaned and either refitted or, as in the case of the Graphite, a replacement cooler is fitted in the form of a full coverage water block. Quality silver-based TIM is always used. 'Like all Cryo systems, the Graphite can be configured in any way, adding or removing system components to suit your personal requirements. A similar system can be made available from as little as £4,000 if, for example, the customer requires only a phase-cooled CPU (in other words, no water cooling) for maximum processing performance and has minimal storage or graphics hardware and no graphite finish. The full review of the Cryo PC Graphite, along with this year's four other Dream PCs, will be published in bit-tech's sister magazine, Custom PC, on-sale 22 October. In the meantime, let us know your thoughts in the forums. Every year we challenge the world's leading professional PC builders to craft the most technologically advanced, innovative, eye-catching PCs they can. We call this competition Dream PCs, and here is the fith and final entry - the TEC water-cooled Scan Jellyfish. Every year we challenge the world's leading professional PC builders to craft the most technologically advanced, innovative, eye-catching PCs they can. 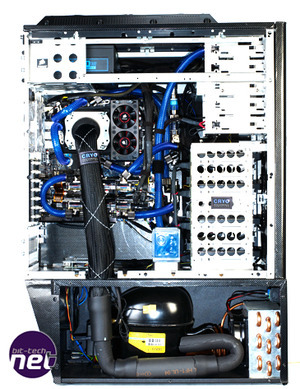 We call this competition Dream PCs, and here is the fourth entry - the TEC water-cooled Kobalt Daedalus. Every year we challenge the world's leading professional PC builders to craft the most technologically advanced, innovative, eye-catching PCs they can. We call this competition Dream PCs, and here is the second entry - the water-cooled Chillblast Fusion Artisan.